Ehormones MD operates under a strict set of privacy principles, taking care to respect the privacy of its online “VISITORS” (visitors and/or members). To better protect your privacy, we provide this notice explaining our online information practices and the choices you can make about the way your information is collected and used. The following discloses our information gathering and dissemination practices for this web site. This site may contain links to other sites. Ehormones MD is not responsible for the privacy practices and/or the content of such websites. Information that can identify any online visitor is collected only when voluntarily offered by the visitor. In cases where Ehormones MD may need personal information to provide visitors with products and/or services tailored specifically for them, or to inform them about new features, products and/or services, visitors are asked explicitly for that information. 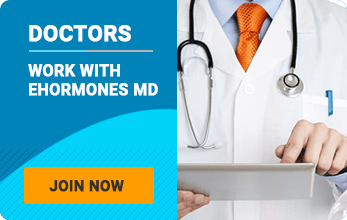 The Ehormones MD website uses several information request forms for members and visitors to request information, products, and services by which personal contact information (such as first and last name, e-mail addresses, phone numbers, etc.) is collected. We will not disclose any of your personal information unless you authorize us to do so, the law requires it, or to protect the rights or property of Ehormones MD. The Ehormones MD website may also collect non-personal information from online visitors in order to track the total number of visitors to the site in aggregate form, identify the type of Internet browser (e.g., Firefox®, Internet Explorer®, Google Chrome®, etc.) and operating system (e.g., Windows®, Macintosh®, etc.) used by the visitor and/or to continuously improve the design of our website. For example, we may tell a third party advertiser that X number of individuals visited a certain area on our web site, or that Y number of men and Z number of women filled out our registration form, but we would not disclose anything that could be used to identify those individuals. Ehormones MD may use your personal information to send you periodic communications, solicit your feedback, provide you with special offers, or for other purposes and to customize the products and/or services we provide to you. Members and visitors may opt-out of receiving future mailings at any time; see the opt-out/choice section, below. Any non-personal information, communications or material you send to Ehormones MD by internet electronic mail (e-mail) are on a non-confidential basis. Ehormones MD is free to use and reproduce any such information freely, and for any purpose whatsoever. The company reserves the right to use such information as part of our promotions and marketing. Specifically, we will be free to use any ideas, concepts, know-how or techniques contained in such information for any purpose, including developing, manufacturing or marketing products. Any information you send to Ehormones MD must be truthful, legal, and not violate the rights or intellectual property of others. Ehormones MD uses the information you provide about yourself only to complete the visitor’s intended transaction. We do not share this information with outside parties except to the extent necessary to complete that transaction. Ehormones MD uses return e-mail addresses to answer incoming e-mails we receive. Such addresses are not used for any other purpose and are not shared with outside parties. When it comes to your health information, our Providers take your privacy and security seriously. This policy explains your rights and some of our responsibilities to you. You can ask to see or obtain an electronic or paper copy of your medical record and other health information we have about you. Ask us how to do this. We will provide a copy or a summary of your health information, usually within 30 days of your request. We may charge a reasonable, cost-based fee when appropriate. We may say “no” to your request, but we’ll tell you why in writing within 60 days. You can ask for a list (accounting) of the times we’ve shared your health and why. We will include all the disclosures except for those about treatment, payment and health care operations, as well as certain other disclosures (such as any you asked us to make). We’ll provide one accounting a year for free but will charge a reasonable, cost-based fee if you ask for another one within 12 months. If you have given someone medical power of attorney (not a durable power of attorney or a general power of attorney) or if someone is your legal guardian, that person can exercise your rights and make choices about your health information. We will make sure the person has this authority and can act for you before we take any action. You can complain if you feel we have violated your rights by contacting us as follows: Squire Patton Boggs, LLP 1900 Phillips Point West 777 South Flagler Drive West Palm Beach, FL 33401 ATTN: Jason Joffe. You can also file a complaint with the U.S. Department of Health and Human Services Office for Civil Rights by sending a letter to 200 Independence Avenue, S.W., Washington, D.C. 20201, calling 1-877-696-6775, or visiting www.hhs.gov/ocr/privacy/hipaa/complaints/. We will not retaliate against you for filing a complaint. For certain health information, you can tell us your choices about what we share. If you have a clear preference for how we share your information in the situations described below, talk to us. Tell us what you want us to do, and we will follow your instructions. In these cases, you have both the right and choice to tell us to: (i) Share information with your family, close friends, or others involved in your care, (ii) Share information in a disaster relief situation, (iii) Share information through communication instructions that you provide to us (text, email, etc.) If you are not able to tell us your preference, for example if you are unconscious, we may go ahead and share your information if we believe it is in your best interest. We may also share your information when needed to lessen a serious and imminent threat to health or safety. We never sell your information, however when you give us written permission, we may use your information for marketing purposes. We can use your health information and share it with other professionals who are treating you. We can use and share your health information to run our practice, improve your care, and contact you when necessary. We can use and share your health information to bill you for services. We are allowed or required to share your information in other ways – usually in ways that contribute to the public good, such as public health and research. We must meet many conditions in the law before we can share your information for these purposes. For more information see: www.hhs.gov/ocr/privacy/hipaa/understanding/consumers/index.html. We can also share health information about you for certain situations such as: (i) Preventing disease, (ii) Helping with product recalls, (iii) Reporting adverse reactions to medications (iv) Reporting suspected abuse, neglect, or domestic violence, (v) preventing or reducing a serious threat to anyone’s health or safety, or (vi) doing research. We may use your personal information to contact you or remind you of appointments when you have requested that we do so. We will also share information about you if state or federal laws require it, including with the Department of Health and Human Services if it wants to see that we’re complying with federal privacy law. We may share your information to respond to requests from a medical examiner, coroner, or funeral director. We may share your information in response to a proper request. For instance, we can use or share health information about you: (i) For workers’ compensation claims, (ii) For law enforcement purposes or with a law enforcement official, (iii) With health oversight agencies for activities authorized by law, (iv) For special government functions such as military, national security, and presidential protective services, (v) To respond to lawsuits and legal actions, (v) In response to a subpoena, or a court or administrative order. We will provide you with copies of your medical records at your request within fifteen days of your request, subject to the conditions and charges allowed by your state’s laws. identified protected health information without your permission. test positive for HIV, we will not release or cause to become known the positive result of such test deidentified statistical or numerical data for purposes of medical research (deidentified means that your identifying information has been removed). We will not use non-deidentified data for research without your permission and consent. We can change the terms of this notice, and the changes will apply to all information we have about you. The new notice will be available upon request, in our office, and on our web site. This Practices applies to the following organizations: Ehormones Management LLC, its subsidiaries and affiliates, it’s affiliated providers and their business associates.